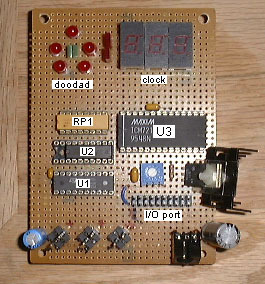 The doodad and clock display was built by Peter Maresh. The clock is driven by a modulo-60 counter, so it can only be used as a clock. The doodad is a pattern of five red LEDs with a green LED in the center. There is no schematic, but it should be obvious. The other stuff you see (TO-220, pot, power connector) is a voltage regulator circuit. It used to be that an transformer was plugged into the connector (+7VDC or more, center ground) and all boards except the controller were powered off of this. Now everything runs off of a regulated switching power supply, so this is unnecessary.